Set in a rural location just 15 mins from the beaches of the Mar Menor and the local airport Murcia (San Javier). The superb buildings keep the charm of the area alive, such as the Manor House which is now fully restored as the clubhouse and the town centre. The lovely apartments look out over the Jack Nicklaus designed golf course and retain the colonial style of the Riquelme family constructions. From Hacienda Riquelme Golf Resort to the nearest town Sucina is only 5 mins by car but is walkable. 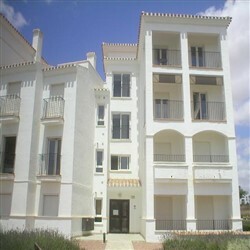 Sucina has supermarkets, bars, restaurants and everything else you need for day to day living. The golfing facilities are excellent and the holiday rental potential from owning an apartment at Hacienda Riquelme is very good indeed. We have a choice of stunning cheap bargain apartments for sale at Hacienda Riquelme Golf Resort and you can view them all by clicking the button below.